As you may have seen earlier this week, I shared a full tour of our cozy Christmas family room, complete with rustic details like our brick fireplace and retro wood paneling. But what I didn’t tell you was that I have one more Christmas living space to share with you, and this one is feeling a whole lot more refined and finished. Why? Well, two reasons. First of all, we recently had the living room, dining room, and kitchen repainted a bright white (High Reflective White from Sherwin Williams), and to say that the change is dramatic would be an understatement. But we also welcomed a brand new Christmas tree to our household this season, and the effect of those glowing white branches is also the stuff of my dreams. Our new holiday tree came by way of Treetopia, and I’m beyond thrilled to be taking part in their Treetopia Design Council 2015, which is centered squarely on technicolor design—a natural inclination of mine! Below, you’ll find my tips for incorporating an avant garde Christmas color scheme in your own house, plus see how far our living room has come since your first peek into our new house back in October. Truth be told, I have been ‘pining’ for a white faux pine tree for several years now, but John never seemed quite convinced. That said, since we now have two living rooms, I was able to get him to agree to a compromise—a green tree in the family room downstairs, and a white tree in the living room upstairs. 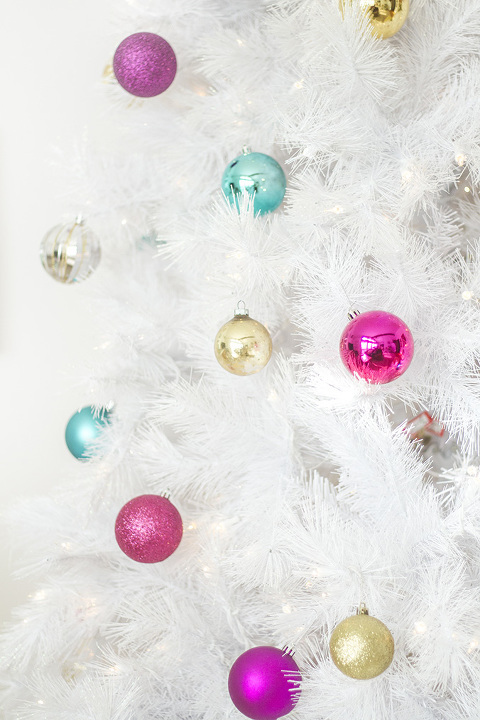 Happily, as soon as I had the tree up and decorated (in under 30 minutes flat, BTW—it was that easy), John fell hard for the crisp white finish and pops of bright color in the ornament collection I chose. Cue my sigh of relief. As for my technicolor theme this year, I chose to start with a collection of bold gold ornaments—some new, some vintage—and then layered on the colors from there. Since we just finished repainting the green walls white, I didn’t add any green ornaments. And red typically isn’t a color I decorate with, so I nixed that shade to make way for hot pink instead. If you’re taking notes, I just admitted to ditching the most classic Christmas color duo there is (red and green), but the effect still feels holiday appropriate thanks to those tell-tale silhouettes and accessories. The moral of the story is that you don’t have to feel stuck with red and green this season. I tend to gravitate towards cool tones and shades of pink year-round, and so those are the colors I use in my Christmas décor. 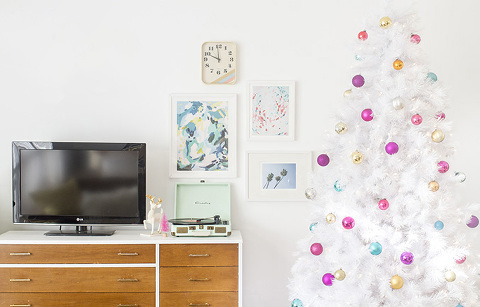 Ever since adopting this anything-goes attitude and seeing that our space still felt seasonally festive, I’ve been gung ho about ditching tradition in lieu of my modern design tendencies. 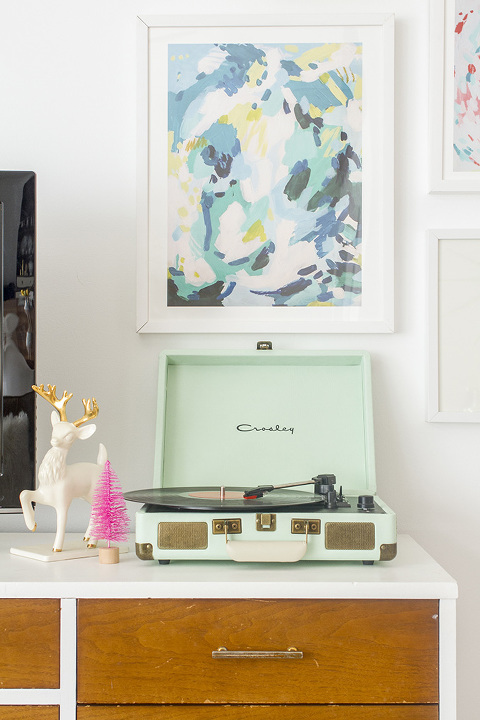 After layering in a new minty fresh Crosely record player (did anyone else immediately purchase this baby after seeing it on Sugar & Cloth a few weeks ago?! #obsessed), our heirloom Waller family reindeer figurines, and artwork in the same color scheme as our newly decked out white tree, we officially welcomed the Christmas spirit into our living room. Now it’s nothing but twinkling lights and Christmas records, and I couldn’t be more giddy that December is finally here. Just like on Tuesday, I’ve got TONS of other links to share. 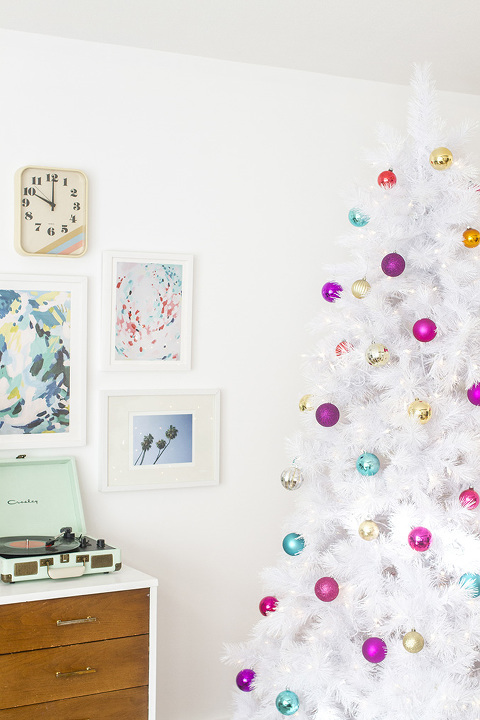 Be sure to click through to Home by Heidi, Lia Griffith, and Love the Day to see how my fellow creatives decked out their own Treetopia Christmas trees in honor of the season. Which is your favorite? I can’t wait to find out.